To celebrate the release of my most recent book, Lighting the Way Home, co-authored with EM Lynley, and the upcoming (May 6th) release of the next installment in the Blue Notes Series, Prelude, I’m running the first of several contests here on my blog! Comment on this post and you’ll be entered to win a copy of your choice of ebook from my back catalog. You can see all my Dreamspinner Press books here. Contest ends Friday, April 12th at midnight! The Blue Notes Series is all about music and love, and many of the stories take place in romantic locations such as Paris, London, and Milan. And Chicago. Yes, Chicago! A very romantic city, in my opinion. 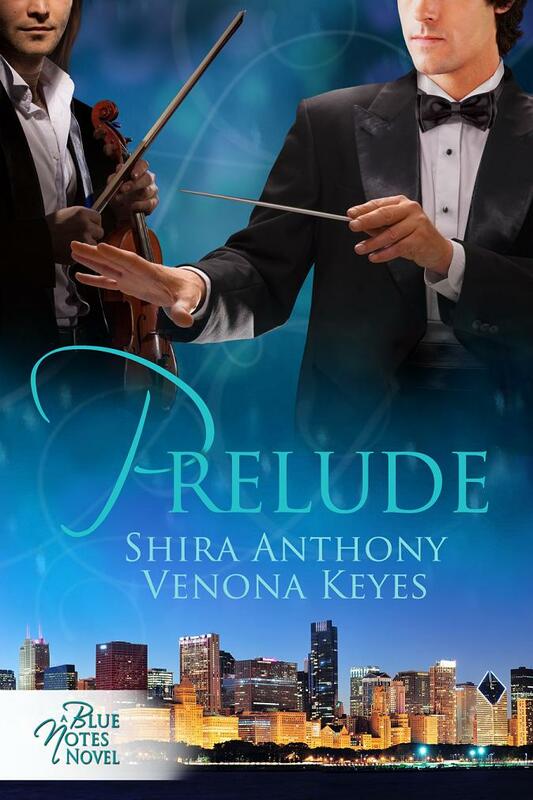 The gorgeous new cover of Prelude showcases the windy city viewed from Lake Michigan. And I’ll be in Chicago from April 18th through the 21st for a Dreamspinner Press author’s workshop/retreat. Can’t wait! Venona, my Prelude co-author, has promised me a special tour of the places hightlighted in Prelude! The story itself is about Chicago native Alex Bishop, who grew up on the rough and cold Chicago streets, bounced from foster home to foster home, and who survived a brutal knife attack that nearly killed him. Instead of dwelling on what’s wrong with his life, Alex looks forward and through his music, is able to pull himself out of poverty and into an international career as a crossover violinist. Alex’s life is a world away from David Somers’s. David, the music director of the Chicago Symphony Orchestra, lived a life of privilege as the heir to the Somers Investments fortune. But underneath his poised exterior, David is still haunted by the loss of his parents when he was a young child, and the iron fist and fiery temper of his grandfather, who raised him. And in spite of his success as a conductor, David still longs to compose music. For David, hearing music is almost like breathing. He hears music in everything he does and in everyone he meets. And when he meets Alex, the music David hears is extraordinary. Prelude is a prequel of sorts to the first three Blue Notes Series books, although it can be read as a standalone novel. David, and Alex to a lesser extent, appears in all three of the first books as a friend and mentor to musicians Cary Redding and Aiden Lind, and is a good friend of Antonio Bianchi and Jason Greene. But the David readers have come to know in those books is not the man you will meet in Prelude. In Prelude, David is uncomfortable in his own skin and unsure of himself. What changes? You’ll have to read the story to find out! BACK IN his apartment in the early hours of the next morning, David lay in bed, gazing out the window of his penthouse. The late-autumn sky was dark and lit with stars. As the first hint of sunrise added a touch of pink on the horizon, he finally closed his eyes and fell asleep. He awoke some time later with a start, covered in sweat, the ache of arousal making his groin pulse. He had a dim recollection of a dream—an image of Alex Bishop. The sound of unfamiliar music faded as his eyes adjusted to the bright morning light. The music was melodic and urgent in its complexity—a counterpoint of bright inquisitiveness woven with a heady romantic tone. Something new and appealing and unlike anything David had ever imagined before. He took a few deep breaths before glancing at the clock. It was late—after ten o’clock—and he’d been asleep only three hours, but he knew he would not sleep again. Instead, he got out of bed and headed for the shower, unwilling to dignify his physical need with the attention it craved. Once finished with his morning ablutions, he tossed a silk bathrobe over his shoulders and made his way to the kitchen. He would need strong coffee to get through the day’s rehearsal schedule without yawning. He poured hot water over the grounds at the bottom of the french press and set it to steep before retrieving the newspaper from the front door. After tossing the paper onto the counter, he turned to the fine arts section to see if there was a review of the prior evening’s concert. What was that music? He tried to recall the dream as he watched the coffee swirl about, but could remember only bits and pieces of it—random phrases, nothing more. He wasn’t disturbed to imagine music when he thought of Alex Bishop. In David’s experience, nearly everything in his life had a certain melody to it, whether it was the memory of an evening spent with Helena at the estate or the view of Lake Michigan from his penthouse apartment. Conflict with his grandfather was as much characterized by music as it was by shouting and pain. Music was part of his life, a sense to be experienced just as the more pedestrian senses of sight and smell. And yet this music was different, somehow. He just couldn’t figure out why. He pushed the plunger to the bottom of the press and poured his coffee. Black was the only way he would drink it today. He needed the clarity of the jolt of caffeine. As he brought the steaming hot liquid to his lips, the phone rang. “Is that so?” He’d figured as much. He cradled the phone against his ear and walked over to the refrigerator to scare up something for breakfast. David managed a quick sip of coffee as she rambled on. David repressed a sigh and put his cup of coffee down. On the telephone, Doris was far more exasperating than in person, and lack of sleep was doing nothing to improve his mood. “Doris, you know I don’t usually contact agents directly.” His stomach lurched. He needed to get her off the phone before the lack of food and caffeine took its toll. Five minutes later, after writing down Kenneth Sykes’s name and phone number, he hung up with a sigh. Damned rock star musicians. Anyone with a modicum of intelligence would jump at a chance to play with the Chicago Symphony—even change his schedule, if need be. Bishop, apparently, was not just anyone. David drank the remainder of his coffee and finished the croissant, fruit, and cheese on his plate with resignation. The croissant, which he’d microwaved to warm, was now slightly hard from sitting, the coffee was cold, and the cheese a bit dry. Begrudgingly, he picked up the phone once more and dialed. “Of course! I’m his assistant, Tiffany” was her gleeful response. “Of course, sir.” She took his number. Did everyone think Chicago in winter was the Arctic? “I will,” he replied, at a loss to come up with any other response. David set the phone down with a sigh. There was a reason he had hired a booking agent. No matter. He’d done what he’d promised. And if Alex Bishop never played with the CSO again, that’d be just fine with him. I’ve read everything on your backlist but just wanted to say good luck with Blue Notes #4 and I can’t wait to read it. I agree Chicago is another romanitc city and I’m sure you will do it justice. I’ve read most of your backlist, except for one that I’ve been meaning to get, so please include me in the drawing. Thanks! Chicago is a delightful, beautiful city! Checkout the bookstores near, and the (Marshall Fields) display windows and Tiffany ceiling. And the food. And the lakefront. And the architecture. Have a great time. Please include me in the drawing, thanks! I always had a tendency to think of classical music as beautiful but very restrained…this series really opens my eyes to the sensuality of it! Chicago is definitely a fun city to visit. I hope you enjoy it! Thanks for sharing the excerpt; this sounds like it will be another good read! Congratulations on your upcoming publication! Please count me in. Thanks! Ah! I am so excited about Prelude! I love the Blue Notes series and have been waiting (impatiently) for David to get his story! I’ve never been to Chicago but I love all the settings from your books! Congrats on this and your latest book! Prelude will go directly to the top of my TBR pile as soon as it is out. Oh my gosh, I am super excited for this book. Have thoroughly enjoyed all of the Blue Notes books and looking forward to reading David’s story. Looking forward to this book. I have the rest of the series and all but 2 of your books. Hope I can add one more after this. What a lovely excerpt, looks like a delightful read. Good luck with the new release and thank you for the giveaway, I have enjoyed reading tidbits about you on the LRC loop. Congrats on your latest book! Have several of your books but in my huge TBR pile. Need to move them up. Looking forward to reading Prelude! Congrats! I love all of these! Looking forward to Prelude! Thanks Boxtersushi (love that name, btw!). I’ve got you entered in the drawing. I hope you enjoy David and Alex’s story!